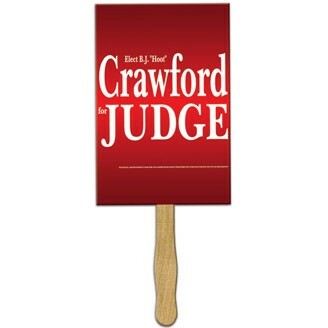 Put your logo in their hands with a 22 point paper board hand fan. Fan is UV coated with high gloss finish on front & uncoated on back. This fan can be printed on both sides, but design art to allow for a glued 12” wooden handle on backside of fan. Fans are mini billboards & perfect for branding a custom message. Great for sports, games, trade shows, fundraisers, churches, businesses, political & corporate events. Many shapes to choose from or call to create a custom shape. Size : 8" x 16"